Japan is going a bit copyright crazy of late. It's not cool to sell customized figures online, it's not cool to rent video games in love hotels, and now, it's apparently not cool to sell Pokémon save data. On Japan's Yahoo! Auctions, there is a cottage industry in which saved in-game Pokémon are bought and sold. Instead of players collecting their own Pokémon, they can just buy 500 or so Pokémons for a price. Pokémon (and in turn Nintendo) are apparently not pleased. This is currently unregulated as games are not being sold, but rather, game data. Thus, it falls into a gray zone. Complicating issues is that players would technically need a ROM to save on, which brings the specter of piracy into the picture. What's more, the point of the game is to collect new Pokémon (Gotta catch 'em all! ), so the buying and selling of them online largely seems to defeat that purpose — or at least, simplifies it. Some Pocket Monsters, however, are given away at special events. And if they can be bought and sold, that certainly makes them less special. According to sources close to the Pokémon, the act of copying saved game data is in violation of Japanese copyright law, because players are ultimately copying original game assets without permission. 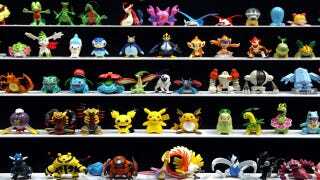 However, The Pokémon Company also owns the copyright on, say, Pokémon cards or toys (pictured above), yet rare ones continue to fetch higher prices via online auctions with collectors.